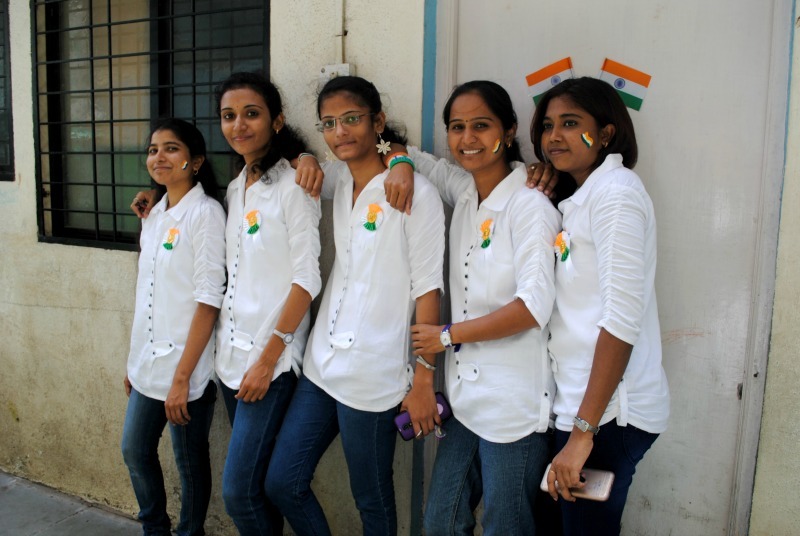 Leading up to our official celebration of India’s 70th Independence Day, the AIC Education Centre was brimming with excitement and patriotism all of last week. Staff and visitors alike were treated to unofficial concerts and mini performances as classes rehearsed their songs and dances to practice for the big day. 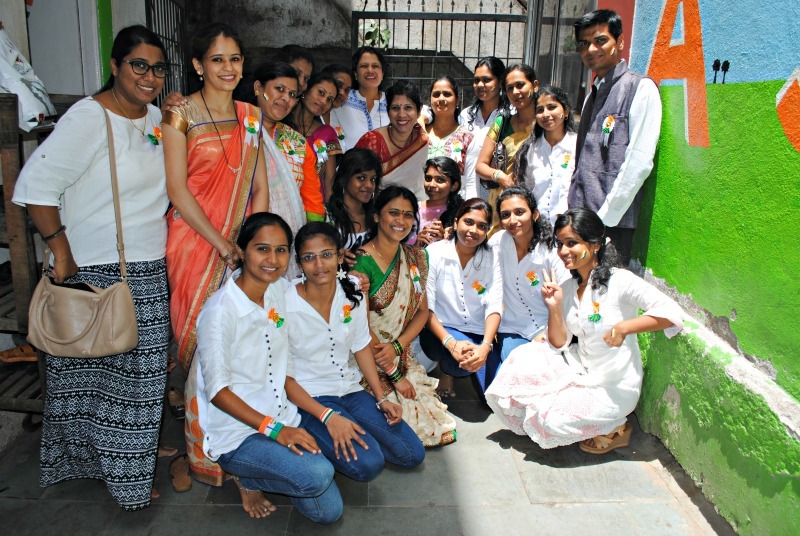 Meanwhile, teachers spent time organizing activities like flag-making to gear up for the main event and squeeze in a lesson on Indian history and civics. Students from the Pre-Primary section through Standard 4 celebrated Independence Day a couple days early on August 13th due to space constraints at our Education Centre (one day we dream of having a campus big enough to hold all of our students at the same time!). 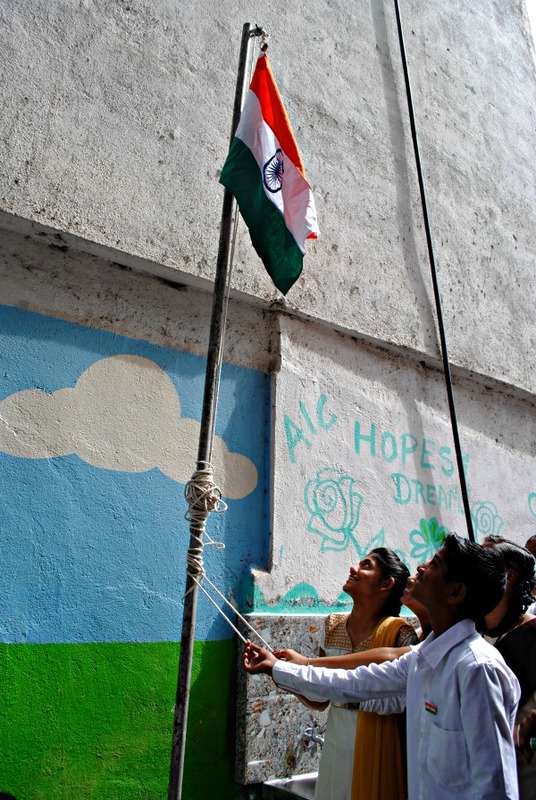 The classrooms were decorated with posters of patriotic leaders, staff dressed for the occasion in gorgeous green and orange saris and other festive outfits, and the morning began with painting the national flag on eager little cheeks. 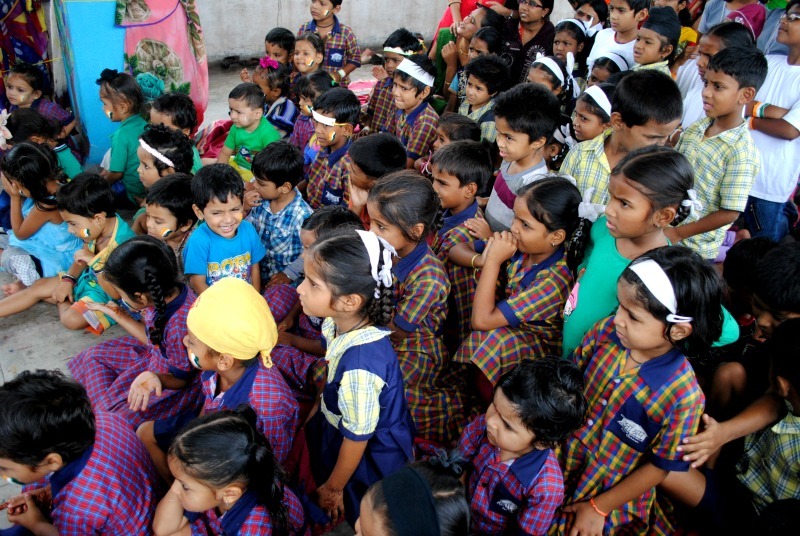 Pre-Primary head, Barnali, began the show by telling the kids about the importance of Independence Day and explaining how freedom fighters like Mahatma Gandhi, Subhash Chandra Bose, and Lokmanya Tilak devoted their entire lives to working for India’s freedom. 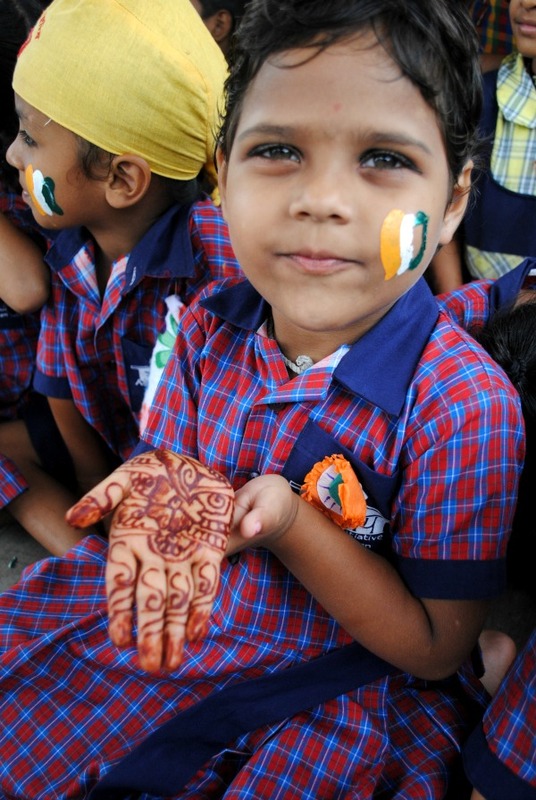 (This included hilarious moments when, after they were asked who said, “Give me blood and I will give you freedom,” (correct answer: Subhash Chandra Bose) the children shouted, “SANJANA!” in unison, referring to a very spunky student in grade 3.) Following this, each grade level performed a song or dance in line with the Independence Day theme. After the enthusiastic start to the celebration on Friday, older students and the entire AIC team waited eagerly for the grand finale today. 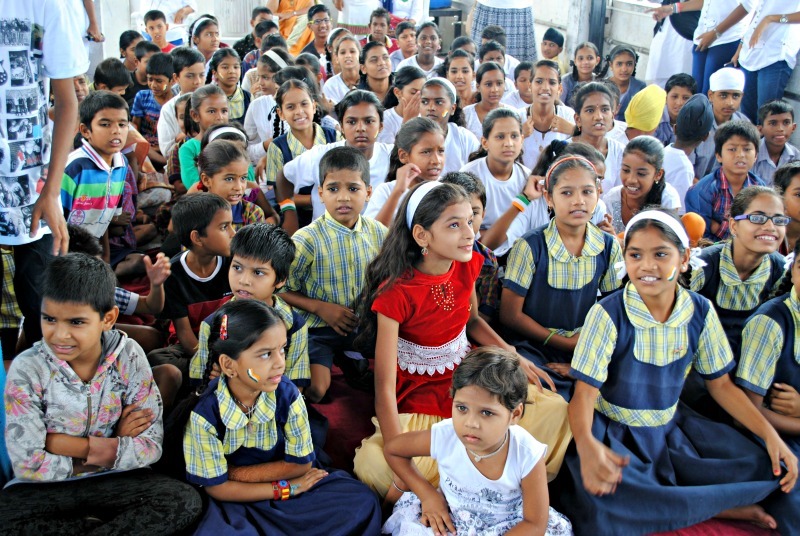 All students from class 5th to 10th had actively prepared for the event and everyone arrived eagerly at the Education Centre well before the required time. Sonu Matole, AIC’s highest scoring Standard 10 student (of all-time! ), was invited to stop in on her way to college to be our guest of honor and hoist the flag. Along with her was Ranjana Prajapati, a student who has been a part of AIC since the earliest days, who was recently selected to represent India on the hockey team at the upcoming Special Olympic Games in Austria. It was a moment of great pride for the entire Ashraya team to see these two hard-working young women inspiring their classmates and peers as guests of honor. Following the flag hoisting, we held a short program in which students talked about the significance of the day, remembered the martyrs who gave up their lives for India, and performed spectacularly choreographed dances (we have some truly talented students!). We also reminded them that Independence Day isn’t just about celebrating the past, but also keeping in mind the its implications for the present and future – honoring those who continue to keep us safe and secure, and remembering the importance of freedom and courage and standing up for one’s rights. 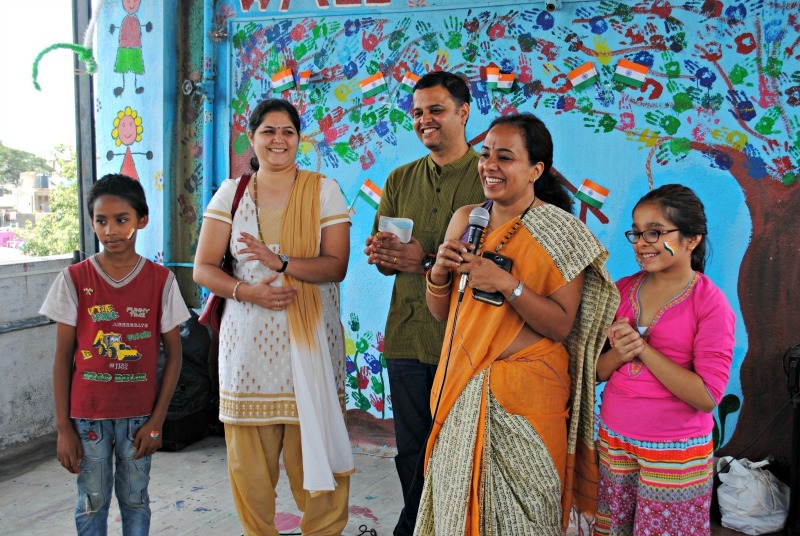 One of our new teachers, Utkarsha, was the compère of the program and did a great job rallying the children and ensuring a smooth event. The surprise of the day was when Nitu Bajwa Malladi, one of the ladies who was part of the baking group Ovenderful that baked for AIC last month, told us that she and her colleagues had been inspired to do their part for society and had decided to collect funds for AIC. She presented us a cheque at the event, much to the raucous approval of the children. Thank you for your generosity, Nitu and friends! The grand finale was the lunch provided by Robin Hood Army, an organization that works to end food shortage around the world. 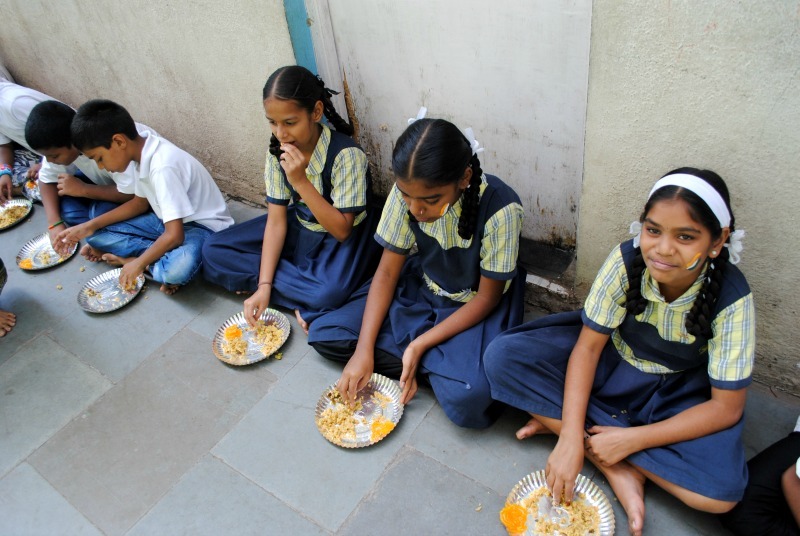 When they reached out and kindly offered to provide a delicious mid-day meal to our students to commemorate the occasion, we were very happy to take them up on the offer. Younger children who had previously celebrated on Friday were invited to come for the lunch component today so that the entire AIC student body could enjoy the lunch. 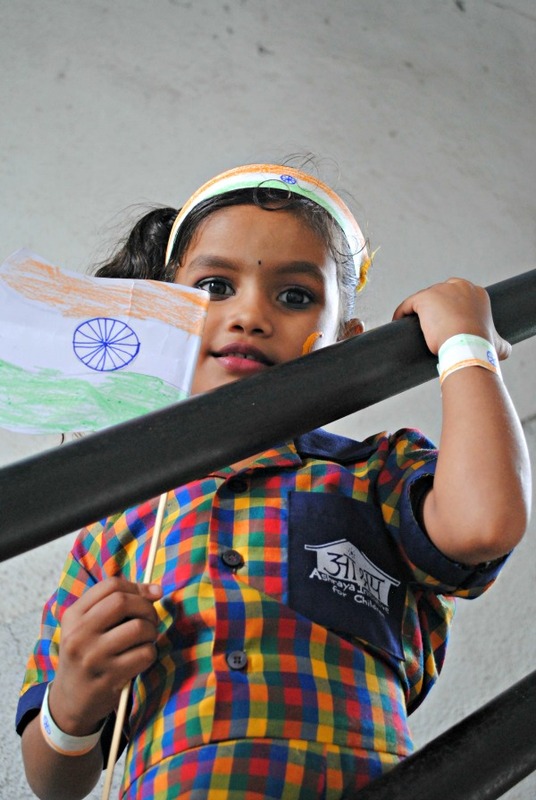 Watching the kids eat the masale bhath (a nutritious preparation of rice and vegetables) and jalebi (type of sweet) with gusto, the entire team felt the 70th Independence Day Celebrations had been a grand day for all. Many thanks to everyone who made this day a tremendous success!